Rush & Tommy Shaw at the Fabulous Forum in L.A., Kiss & Anthrax at the Thomas & Mack Center in Las Vegas, Homeless Benefit with October, Ashawn & Dear John at the Whiskey A-Go-Go (but for some reason I don’t think this ended up being at the Whiskey), The Zeros at the Whiskey, Iron Maiden at the Fabulous Forum, Monsters of Rock (with Metallica, Van Halen, Dokken, Kingdom Come & the Scorpions) tour at L.A. Memorial Coliseum, Kix, Taz, Skid Row & Tramp at the Country Club in Reseda, Def Leppard & Europe at Irvine Meadows, and Elton John at the Hollywood Bowl. Not a busy concert venue year – I know we saw a lot of local bands that year like Faster Pussycat, D’Molls, and Love/Hate (one member of which was me and my bf’s roomie), and a lot of other stuff was going on that fell in line with the demise of the ’80s. I have a recollection of seeing Guns ‘n Roses at the Cathouse but I can’t tell you what year. Damn memory banks…will it all flash by me someday? I’m thinking that might be a bit overwhelming, but I sure wish I remembered more details than I do about 1986-1988. Memories are such a mystery – it’s no wonder they are so intensely studied in psychology. Why do we forget? I can easily throw out some brain-cell killing reasons for the lapse, but that doesn’t explain the great expanse of the loss. Luckily my pals and I can often piece stuff together, with each of us remembering bits here and there. If I had the time, it would be fun (and maybe sometimes traumatizing) to try to really dig into our collective memories. I’m so glad I saved these ticket stubs – maybe fading memories are the reason why we feel the need to hold on to things. It’s good to have something to jog the memory. 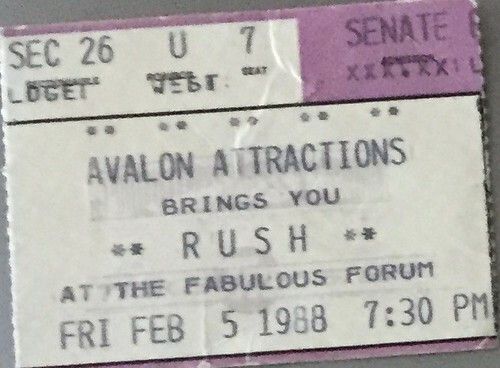 Rush on 2-5-1988 at the Fabulous Forum in Los Angeles, California. Looks like the ticket was comped. According to rushchronicles.com, Tommy Shaw opened this show. 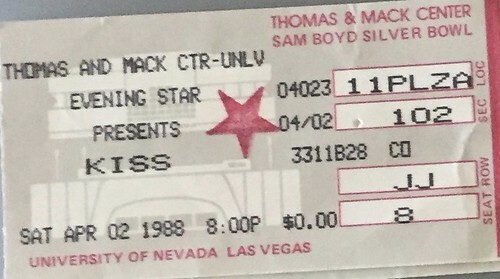 Kiss on 4-2-1988 at Thomas & Mack Center at the University of Las Vegas in Nevada – road trip. According to Kissmonster.com, Anthrax opened on this tour. Looks like this ticket was also comped – backstage pass and movie star photo of me on that trip below…. 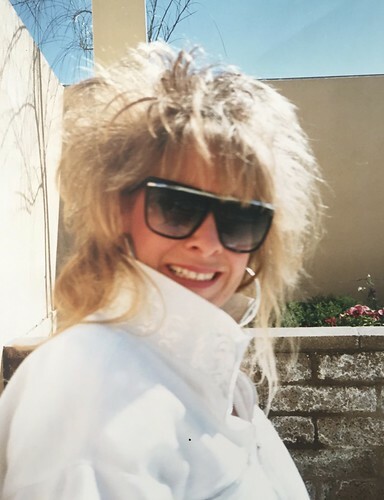 Me in 1988 in Las Vegas, Nevada. I died my hair black about a month later, and didn’t go blonde again until 1996. I’m really confused about this one. October was my pal Brett Miller’s band (and later my bff Randee was in it). I have a memory of this show being somewhere in downtown LA at a rundown theater – not the Whiskey, and that my MOM (of all people) was with me (visiting from Florida), and that she was excited because she got to meet Sally Struthers and, um, some famous football player backstage (he had a refrigerator nickname of some sort). I also remember a homeless man wandered in and sat behind us in the run down velvet seats, with a take out container amongst his belongings, and offered his half-eaten sandwich to my mom – and she was genuinely touched ;o). But I also seem to remember my friend Beverly’s band playing at it as well, the Peckinpahs. I just don’t know, perhaps I’m confusing it with a different benefit and the time mama came to drag me back from Cali. The Zeros on 6-5-1988 at the Whiskey in Los Angeles. Dance concert? Found the little sticker with my stuff. One of those bands that should have made it big. 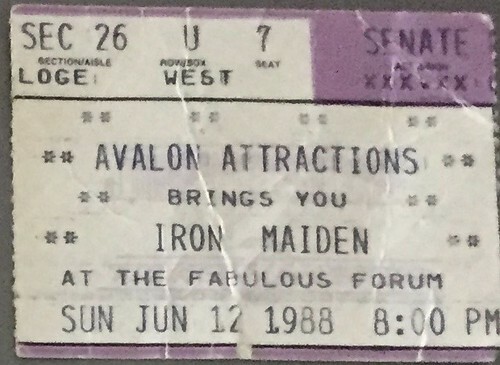 Iron Maiden on 6-12-1988 at the Fabulous Forum in Los Angeles, California. According to Ironmaidencommentary.com, several bands opened on the worldwide Seventh Tour of a Seventh Tour: Guns n’ Roses, Megadeth, Killer Dwarfs, Hurricane, Helloween, Zodiac Mindwarp, Ace Frehley’s Comet, Backstreet Girls, and some other bands whose logos are difficult to decipher. I can’t seem to pinpoint who opened this show. Interestingly, Savatage opened the Tampa show. The Monsters of Rock tour with Van Halen, Metallica, Kingdom Come, Dokken, and the Scorpions at the L.A. Coliseum (wherever that is/was, I don’t recall ever going there for any other show). Cost $25.00 with a $3 service charge. 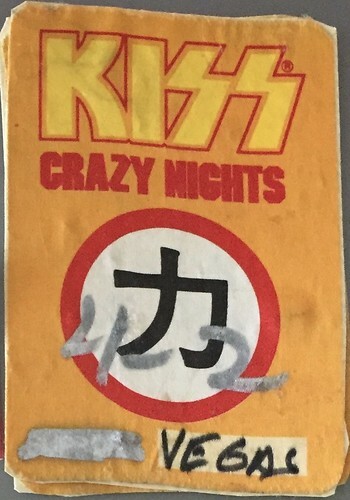 As you can see from the full ticket (in the days before scanning), I did not go to this show much to my everlasting dismay, though I was very much looking forward to it. Among other issues, my car was broken down. According to the the L.A. Times, the show was postponed by a day due to Sammy Hagar having strep throat, 80,000 people attended the concert, and there was a near riot when fans left their assigned seats and rushed the field – there is also some interesting commentary on Sam vs. Dave as frontmen. Amusingly enough, an L.A. Times article a few days earlier talked about poor ticket sales for the tour, “possibly because the tickets were going as high as $28.” Ha! Who would have guessed 30 years later you’d be paying almost $28 just in service charges. 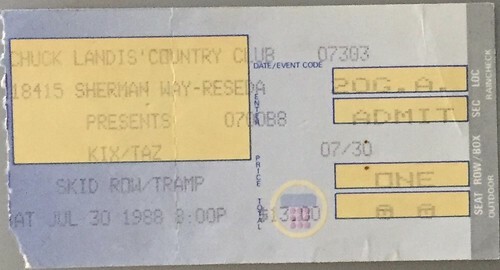 Kix, Taz, Skid Row and Tramp on 7-30-1988 at the Country Club in Reseda, California. Cost $13. Man, how I’d love to see this show today! 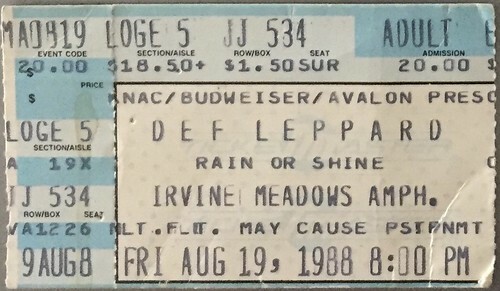 Def Leppard on 8-19-1988 at the Irvine Meadows Ampitheatre in Irvine, California. Cost $20 with a $1.50 service charge. I remember I decided at this show that I was (and still am) more of an old-school Def Leppard fan over the Hysteria sound. According to concertarchives.org, Europe opened this show. 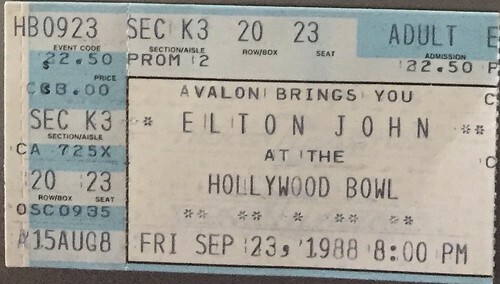 Elton John on 9-23-1988 at the Hollywood Bowl. Cost $22.50 with a $3 service charge. I do remember being very excited about going to this show. I can’t find where anyone opened for Elton on the Reg Strikes Back tour. 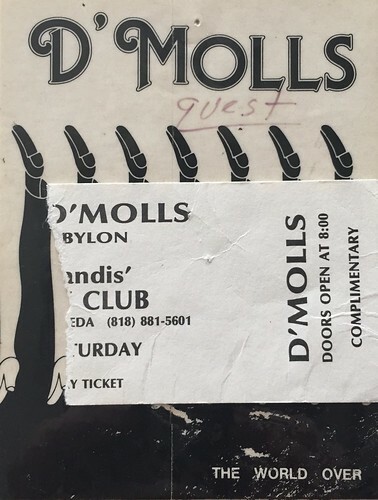 I tried to look up the exact date of this D’Molls show at the Country Club in Reseda but I can’t quite tell, although I’m pretty sure it was 1988. Wow though, according to setlist.fm, there sure were a lot of great shows at the Country Club in 1988. It’s cool to still hear the D’Molls song D’Stroll on Sirius XM Hairnation every now and then. Copyright 2017 Rocksandy. All Rights reserved. I am looking for some stubs would you sell any of these ? Hey Dennis – The only ones I have are what you see for the 87 and 88 posts. I mostly saw GnR in the clubs and there were no ticket stubs involved. 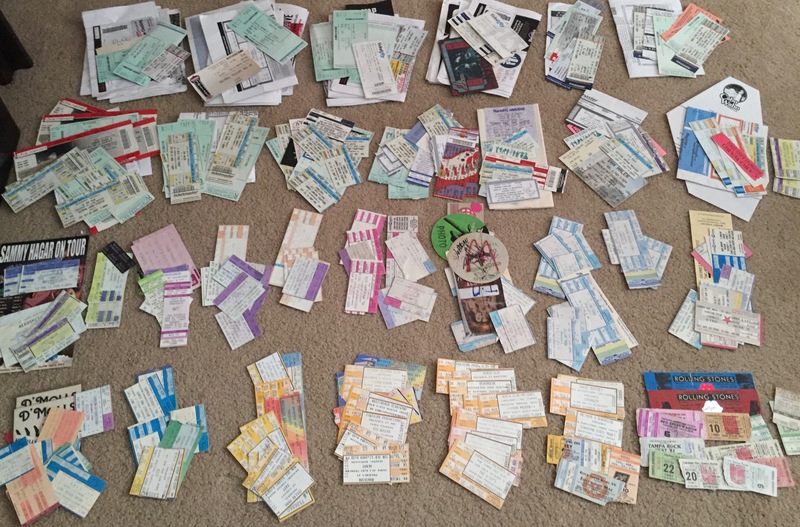 And gee, never thought about selling them or what I would do with them “someday.” Unless you’re offering some amount I can’t refuse, I suppose I will eventually donate the collection as a whole to the local music scene museum … or the Smithsonian … or something…LOL. I’m going to run your request by a friend in LA and she might have something and be interested. Thanks for checking out my blog!